Turducken? Turducken is nothing. Behold Cthulken. Or Craturktopus. Perhaps Turkrakon. 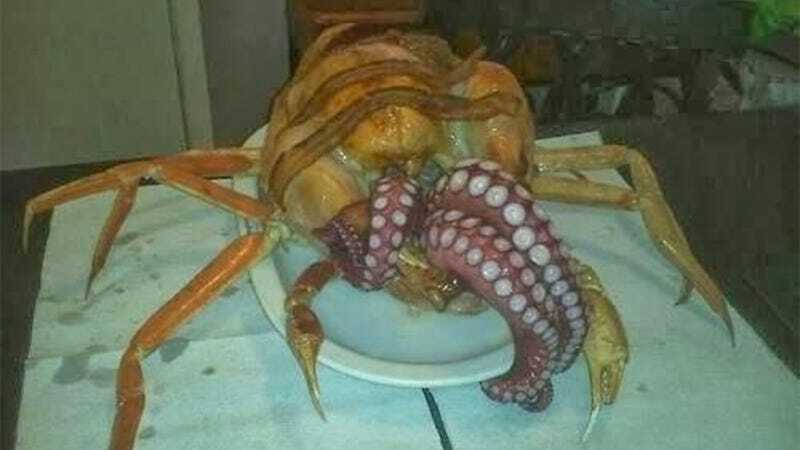 Whatever you call this dark combination of turkey, crab legs, bacon and Elder God, it is the one true Last Supper. Reddit's doc_birdman, along with numerous unnamed agents of chaos lurking in the shadows, shared this image with the internet over the weekend. It's been circling the outer fringes of the informationsphere for ages, but now it's finally food a home, it's spear-like claws taking root. Could it be worse? Just wait until you turn it over, and the mouths of a hundred infants cry our from its underside, pink and innocent, yet lined with razor-sharp teeth. No, I will not do a Snacktaku on this. Update: The original image was uploaded to Twitter by one Rusty Eulberg. You can read an interview with him about his creation over at Gothamist.